The revitalization included renovations to approximately 8,500 sq. 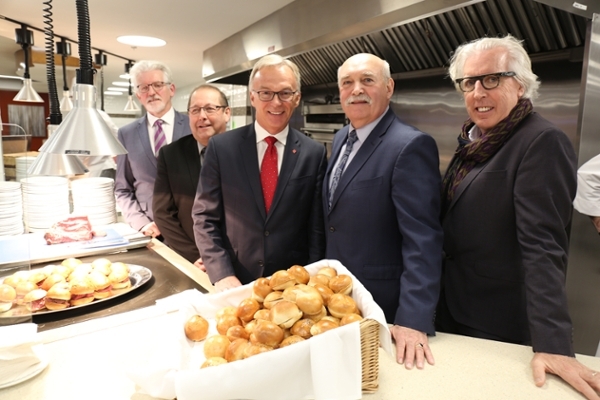 ft. in Holland College’s Tourism and Culinary Centre, located on the Charlottetown harbourfront, an expansion to incorporate a state-of-the-art butchery, a cold cuisine production kitchen, and more than $1.8 million in the latest technology and equipment. The dining room was expanded, and the cafeteria was completely redesigned to better replicate the modern food service environment. In this picture: (L-R) Holland College president Dr. Sandy MacDonald; Hon. Sonny Gallant, minister of Workforce and Advanced Learning; MP Sean Casey; Dr. Brian McMillan, former Holland College president; and Kevin Murphy, Chair of the Nourish campaign.